The high-end property boom of the last few years, particularly in the top two prime locations in the Klang Valley – KLCC and Mont' Kiara/Sri Hartamas, has made it increasingly more expensive to own a condominium, serviced apartment or landed property. In the case of Mont Kiara (MK) and its adjacent Sri Hartamas, an affluent neighbourhood popular with expatriates, prices of newly launched condominiums have shot up to over RM800 psf with some hitting the RM900 psf mark! In the early 1990s, condominiums built by the Sunrise Bhd Group such as the MK Pines and MK Palma were around RM300 psf. Despite fears of over building, soaring prices and congested vehicular traffic, this neighbourhood has continued to attract both investors and home owners, Today, it has evolved into a very self-contained, much sought-after residential enclave of top quality condominiums, bungalows/villas and other high-end residential properties. As Henry Butcher Marketing Sdn Bhd chief operating officer Tang Chee Meng said there was now a greater variety of property types available compared to the early days of Mont' Kiara's development. “While the earlier developments have average built-up areas of 1,200 to 1,800 sq ft (MK Pines, MK Palma and Vista Kiara) catering to small and medium sized families, the newer projects that have been launched in Mont' Kiara and Sri Hartamas offer a greater variety of unit types catering to different budgets and preferences,” he said. They range from very small studio units of 400 to 600 sq ft (Mayfair and Dorchester) catering to singles; small units of 600 to 800 sq ft (Verve Suites, One Kiara) catering to singles and newly married couples; standard sized units of 1,000 to 2,000 sq ft units (One Kiara, Kiara 3, Cerian Kiara) catering to small and medium sized families and large units of 2,000 to 3,000 sq ft units (11@MK, Seni Mont' Kiara) catering to more well off families. “There are also the super large units of above 3,000 sq ft (Matahari, MK10) for the well heeled. As the prices of the condominiums in Mont' Kiara and Sri Hartamas have gone up, the profile of the buyers also indicate that they are now of a higher income group,” he said, adding that condominium prices in Mont' Kiara have gone up significantly. “Some of these new projects are Sunway Vivaldi (RM800 to RM900 psf), Palazzio (RM840 psf), and Matahari (RM800 psf). Generally for a RM1mil property, based on an 80% loan and an interest rate of 5% per annum for 20 years, the qualifying monthly income is RM15,000 whilst the monthly income required to qualify for a 80% loan for a RM2mil home will be RM30,000,” he said. According to Tang, the nearly sold-out Kiara 1888 that Henry Butcher marketed has risen 25% to 30% although it is still under construction while Kiara 9 has been released at new benchmark prices. Meanwhile, the current economic uncertainties have seen some people adopting a “wait-and-see” attitude. There are also signs of over-building in many places including Mont' Kiara. Tang agreed that while rentals have remained stable, vacancy rates appeared to have increased due to the large number of units that have been completed in Mont' Kiara. “One of the chief concerns of potential investors is the fear of oversupply of condos in Mont' Kiara and whether the rental market will hold. Another concern is the worsening traffic congestion due to the increased number of residents in the area,” he said. With scarcity of land in Mont' Kiara, industry observers believe that developments in Mont' Kiara will spill over to Segambut. “We believe that in years to come, Mont' Kiara and Segambut will be linked up in a seamless corridor by the new developments. For the moment there is still a price disparity as projects at the Segambut side are still significantly cheaper. In future this price disparity may be narrowed although we believe that there will always be the price differential,” he added. Tang said overall the property market would be soft, in view of the political uncertainty as well as the slow down in economic growth but the Mont' Kiara/Sri Hartamas area would still continue to attract interest. “However, investors are now more cautious and will be more selective. Projects with more innovative concepts undertaken by reputable developers will still be able to attract interest, provided that investors are convinced that the pricing is fair value vis a vis the design and quality of the project,” he said. The feverish pace of development in Mont' Kiara and Sri Hartamas in Kuala Lumpur is astounding. Many new condominium, bungalow and commercial projects are turning this neighbourhood into a vibrant international community. Although this neighbourhood had witnessed many developments over the past decade, this is probably the first time that construction of so many condominiums, bungalows and commercial projects are in full swing. There is an “explosion” of commercial projects: the swanky Solaris Mont' Kiara (with its touristic Soho KL dining-entertainment facility and tenant Cold Storage supermarket) have been newly completed while the big Solaris Dutamas (400 shop lots, 900 office suites, 800 designer suites plus two open piazzas) and Verve Shops are nearing completion. Ireka Land and CapitaLand are developing the One Mont' Kiara, retail, office suites and residential project opposite Sunrise's Plaza Mont' Kiara. It will boast of a 250,000 sq ft specialised retail mall with luxury serviced residences i-Zen@Kiara 1 and i-Zen@Kiara 2 behind. Over at Sri Hartamas is the proposed Plaza Damas 3 by the Mayland Group, opposite the Hartamas Shopping Centre. This is where Sunrise Bhd, the original and biggest developer in Mont' Kiara, has its flagship developments on both sides of busy Jalan Kiara 1. Today, Sunrise is launching projects that are even more high-end in Mont' Kiara like the 10' Mont Kiara, 11 Mont' Kiara, 28 Mont' Kiara and the Mont' Kiara Meridien condominiums. Its older condominiums (all with the words Mont' Kiara in front) include Sophia, Pines, Palma, Astana, Bayu, Aman, Bayan and Damai. Projects by other developers have also mushroomed amidst this “global village”. 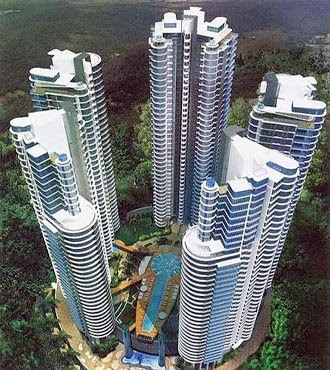 Aseana Properties is developing the Tiffani by i-Zen and Seni Mont' Kiara. Some of the earlier projects here include Almaspuri and Angkupuri condominiums and UOA Holdings's bungalow project, Villa Mont' Kiara, completed in 2004. One end of Jalan Kiara 1 is seeing a burst of new projects including the Lumina Kiara, Sunrise's The Residence @ Mont' Kiara (2 and 3-storey bungalows), Tiffani by i-Zen (both under construction), fairly new La Grande Kiara and Wedgewood Serviced Residences. There is also the newly completed Kiaraville (by Ireka), facing the Solaris Mont' Kiara, i-Zen @ Villa Aseana, Puncak Kiara (by Merge Power) and PJD's Regency project. Sunway City's high-end projects in the area include Kiara Hills, Casa Kiara 1, 2 and 3, Palazzio Sunway and the Sunway Vivaldi (with units priced from RM2.59mil to RM6.29mil!). Several new condominiums are also coming up or completed along Jalan Kiara 3 that leads to Segambut via Kampung Segambut Dalam. From the junction of Jalan Desa Kiara and Jalan Kiara 3 (on the right) are the Lanai Kiara, Flora Murni (by Tian Global), Vista Kiara (Asia Quest), Laman Suria (Sunrise), Ceriaan Kiara (YNH Property) and Kiara 1888 (Mitraland) while on the left are the Garden International School, Kiara Designer Suites (Sunrise) and Kiara 9 (Mitrajaya). Asia Quest's Kiaramas is on a low hill. Behind this road is Jalan Kiara 5 where Bukit Kiara Properties Sdn Bhd's three projects, the Aman Kiara (first gated community in the area with bungalows and condovillas), Hijauan Kiara and the Verve Suites are located. Desa Sri Hartamas is a “hip and happening place” with lots of F & B outlets while Taman Sri Hartamas has the Hartamas Shopping Centre (Taylor's College recently opened a new campus there) and Plaza Damas shop offices (both by the Mayland Group). Mayland's latest project, Plaza Damas 3 offers five-star freehold shop offices with separate strata titles and 1,500 parking bays. Checks showed that almost all 72 units of shop offices have been sold with only six units left. 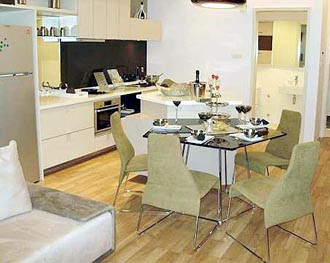 There will also be 1,450 serviced apartment units. Glomac also has a proposed commercial project called the Glomac Galleria here. Maymont Development Sdn Bhd's 158-unit Matahari, luxury super condominium in Desa Sri Hartamas recently won the CNBC Asia Pacific Property Awards for the Best Apartment (Malaysia category). With only two units per floor, the minimum built-up is about 3,900 sq ft to the biggest of 10,700 sq ft! The price range is from RM3.1mil to RM10.77mil! A new player next to Hartamas Shopping Centre is Duta Land Bhd's proposed Kenny Heights Estate, an upmarket private sanctuary, along Jalan Hartamas. It offers 49 residences each with its own private pools, elevator, sundeck bath, and two garages. The gated community will also have a pool house, with a 30m-sky pool and spa pool. There will be 20 limited edition villas designed by Kengo Kuma. Adjacent to it is S. P. Setia Bhd's Duta Tropika and Duta Nusantara bungalow projects. Further down the road are the Hartamas Heights bungalow enclave and the Hartamas Regency 1 and 2 condominiums that meet up with Jalan Kiara 1. Bukit Kiara Properties Sdn Bhd managing director N.K. Tong said Mont' Kiara is thriving because it is an “oasis of innovative developments” by a growing number of developers. Competition is intense because of the number of developments there. “However, each developer has found its own unique niche. This has resulted in a growing suburb that rivals KLCC in attracting foreign investment,” he said. Tong said with three top international schools, Mont' Kiara has become a sought-after address for expatriates. “The social infrastructure is further strengthened with new commercial developments, retail opportunities and recreational facilities,” he said. Although there are fears that Mont' Kiara is becoming a “concrete jungle” there are also mitigating factors like continuous improvements to the road system. Y&Y Property Development Sdn Bhd plans to build its second boutique hotel in Kuala Lumpur as it seeks to take advantage of the growing tourism industry. It is also a new venture for the company, which mainly builds industrial properties. “Hotels have good returns and Y&Y has been mulling to build them for a long time. When it identified strategic locations and older buildings for conversion, it decided to move in,” Mike Hue, Y&Y sales and marketing manager told Business Times in an interview recently. Y&Y was founded by the Yong family. The company started as a textile manufacturer, trader and garment retailer in the 1980s. It is now building its first boutique hotel for some RM30 million at Tengkat Tong Shin off Jalan Bukit Bintang. The hotel will be run under the Hip Hotels brand, a popular name in US and Europe. The eight-and-half-storey building, which will be completed by September, will be open by December. It will have 117 rooms priced from RM88 each per night. Hue said Y&Y has initiated plans to build a second Hip hotel in the city next year. The company, he said, had bought an old six-storey office block near the Masjid Jamek light rail transit station on Jalan Tun Perak. It will be converted into a Hip hotel in the second half of 2009. Apart from the hotel, Y&Y Property is also building its first shopping mall in Cheras, named 1 Shamelin. This is due to be completed in the middle of 2009. The company has also earmarked a plot of land it owns opposite the Putra World Trade Centre in Kuala Lumpur for its second mall. Leveraging on its residential, office, retail, and hospitality development competencies, CapitaLand Ltd is keen to expand its foray to more growth markets overseas, a senior company executive said. By market capitalisation, CapitaLand is the largest real estate company in Southeast Asia. Of its total assets of S$25bil, S$16.2bil or 65% of the total are invested overseas in over 20 countries and over 120 cities. Its core businesses in real estate, hospitality and real estate financial services are focused in growth cities in the Asia Pacific, Europe and the Gulf Co-operation Council (GCC) countries. CapitaLand's real estate and hospitality portfolio spans more than 110 cities in over 20 countries. “The company has the experience and expertise along the entire real estate value chain and exporting real estate expertise overseas has been the company’s forte. “Being an investor, developer, operator and manager of real estate, we also provide financial solutions across sectors and geographies,” the executive said. CapitaLand believes in leveraging on its huge asset base, real estate domain knowledge, financial skills and extensive market network to develop real estate financial products and services in Singapore and the region. Since its formation at end-2000, CapitaLand has consistently leveraged on its multi-sector strategy, and its expertise and experience across the whole real estate sector to create shareholder value of over S$19bil. With more than 70 malls and residential developments in Chinese cities such as Shanghai and Beijing, CapitaLand achieved close to 30% of its revenue in China last year, up from 20% in 2006. “Essentially the success factor is CapitaLand’s track record of innovative asset enhancements be it in Singapore, China or Malaysia. “These asset enhancement initiatives create significant value at these malls through proactive management and retail real estate management expertise,” the executive said. He added that China was an excellent example of CapitaLand’s growth overseas by exporting its real estate value chain. CapitaLand has been in China for over 13 years, with the country accounting for 30% of the company's total assets in the first six months of this year. “We have an extensive presence in China. We enjoy a stable operating environment in Shanghai, Beijing, Guangzhou and healthy fundamentals in inner cities such as Chengdu and within the Henan province. “As the largest foreign player in Chinese shopping malls, CapitaLand’s retail footprint now extends beyond 70 malls across 28 cities, with most of the malls anchored by Wal-Mart, Carrefour or Beijing Hualian,” he said. CapitaLand recently signed a cooperative agreement with China Vanke Co. Ltd., China’s largest residential developer, to acquire new and existing retail components within Vanke’s townships. On the commercial property sector, CapitaLand owns Raffles City Shanghai and Capital Tower Beijing. Under development are three more Raffles City developments in Beijing, Chengdu and Hangzhou. These highly integrated developments comprise retail, commercial and serviced residence components. Each development is strategically located in the core central business district and at the nodes of main transport networks. Bukit Kiara Properties Sdn Bhd's (BKP) has sold about 40% of its latest 255-unit Vogue Tower in Verve Suites that was previewed on June 21 to an exclusive group without any advertisements. This is the third of the four-tower Verve Suites on a 5.87-acre freehold land and is BKP's third project in Mont' Kiara. The first two are the Aman Kiara and Hijauan Kiara that are fully sold and completed. BKP managing director N. K. Tong who is pleased with the sales over four weekends said the company has over 13,000 registrants, many of whom were repeat buyers. The Verve Suites was planned to have 881 units in the four towers. However, Tong said the number of units in the fourth block called Vox Tower had not been decided yet. As expected, BKP has increased its price where the average selling price of the Vogue Tower unit is about RM930 psf (minimum is RM850 psf) for the two unit size of 462 sq ft (one bedroom) and 932 sq ft (two bedrooms) with prices from RM399,000 to RM988,000. Although the price is higher than the 240-unit Viva Tower (first block/initial RM570 psf) and the 188-unit Vibe Tower (second block/initially RM650 psf) that were launched in 2006 and 2007 respectively, the Vogue Tower's pricing is deemed “reasonable” considering that all Verve Suites units come with top quality furnishing and fixtures including Bosch kitchen appliances. There are four interior design themes: Centro Jazz and Cosmo Grove (both 462 sq ft type) and Verdant Luxe and Metro Bliss (both 932 sq ft type). BKP has demolished its Pavilion show gallery and moved to an even bigger show gallery with four Vogue Tower show units on the first two floors of the Verve Shops (a 60,000 sq ft of retail space for lease only) where construction had reached the roof level. A posh show kitchen with Gaggenau (the Rolls Royce of kitchen systems) appliances for the Vibe Tower's Hypercube sky lounge is also on show at the new gallery. The Vogue Tower also has a sky lounge like the other two towers. It's called The Garden of Concentrico on the 31st floor that provides a “Back-to-Nature” escapade with facilities like the Aqua Gym, Cinema Paradiso, Podium Panorama and Dinner Alfresco. There will be a range of aqua exercises including water aerobics that the family will enjoy at the Aqua Gym. At the Cinema Paradiso, one can enjoy a big screen movie under a starry night setting or view the entire Mont' Kiara while lying on a hammock at the Podium Panorama. You can also dine at the Dinner Alfresco under the open sky amidst a green setting. By paying only 33psf service charge (inclusive of sinking fund), Verve Suites residents can have access to all the sky lounges that are the signature selling points. Instead of having a big living space in one's unit, one can have huge and varied dining, recreational and entertainment facilities in all sky lounges including the ample facilities such as two tennis courts, squash courts, badminton court, multi-purpose hall and two swimming pools at the recreational deck below. The third swimming pool is at the Vibe Tower's Hypercubes Lounge on the 27th floor that also boasts of its unique entertainment concept. Meanwhile, BKP's Aman Kiara (completed nine months ahead of schedule) became the first bungalow and duplex condovillas project in Kuala Lumpur to obtain approval for its strata title application recently. The success of the Verve Suites in the high-end Mont' Kiara neighbourhood has proven once again that product differentiation is vital in today's stiff competition. Instead of building another condominium, Bukit Kiara Properties Sdn Bhd (BKP) continued its tradition of offering niche and innovative products, this time in the form of fully furnished serviced suites and introduced sky lounges each with a different concept. BKP managing director N. K. Tong said when Verve Suites was first conceptualised over three years ago, it set out to create something different, exciting and innovative. “What has happened since has even caught us by surprise. Verve Suites first introduced the concept of the sky lounge; with the Vertigo Living Concept spread over 6,000 sq ft. It was a bold move because we gave up the most valuable piece of saleable real estate, the penthouse, to be a common facility,” he said. “Since then, we have introduced two other living concepts, the Hypercubes Living Concept and the Concentrico Living Concept in the subsequent blocks in Verve Suites,” he told StarBiz. What will be the living concept for the fourth and final block? Well, Tong is keeping mum except to say that it would be very much based on feedback from customers and the BKP team. On rising construction costs, Tong said all Verve Suites phases were moving according to schedule. “Rising prices are a challenge and a fact of life. It will have a direct impact on costs, reduced profit margins, and rising selling prices. Each successive block of Verve Suites has continued to appreciate in price, and our customers are understanding and philosophical in their approach,” he said. Tong said some had bought units in all the three Verve Suites blocks, and were looking forward to the preview of the fourth block, even acknowledging that the price would further increase. “This is a good time to buy properties. While costs continue to rise, we at BKP have to accept reduced profit margins but continue selling at today's pricing. This will benefit our customers as they lock in properties at historical prices, while costs continue to rise,” he added. Tong said Mont' Kiara's success was also reflected in the increasing land prices over the years: from RM5 to RM10 psf in the early 1990s to RM50 to RM70 psf at the end of the 90s and into the early 2000. “Today, the prices are probably around RM200 to RM250 psf. This increase has forced developers to develop new projects with larger units, to defray the high cost of land. This trend works in favour of Verve Suites as its compact units become highly sought after, being unique as well as affordable,” Tong said. Recent secondary transactions of BKP's Hijauan Kiara units have reached close to RM660psf, a 40% capital appreciation from the original RM470 psf when it was first launched in mid-2005. Tong believes that Mont' Kiara and the KLCC were both critical in putting Kuala Lumpur and Malaysia on the global real estate investment map. PROPERTY developer Glomac Bhd plans to launch a 1.5 billion baht (RM158.70 million) real estate investment trust (REIT) in Thailand by October. Business Times understands that it will launch the REIT with its partner Warehouse Asia Alliance Company Ltd (WAA), a leading Thai company in warehousing and logistics services. The main-board developer and WAA will initially inject a 600,000 sq ft warehouse near the Bangna-Trad highway in the Samutprakarn province in Bangkok, worth RM150 million, into the REIT. The warehouse, which is 49 per cent owned by Glomac and 51 per cent by WAA, was constructed by the two firms for RM125 million in April. It is currently fully tenanted to Diethelm Ltd, an international pharmaceutical company, for 15 years, with rental yield of 13 per cent. The source said Glomac and WAA will increase the REIT size, possibly to six or seven billion Thai baht in three to four years. Glomac group executive vice-chairman Datuk Richard Fong and group managing director Datuk Fateh Iskandar Mansor were not available for comment at press time. "The two firms want to set up similar warehouses in Thailand as it is a profitable business and there is demand. They are looking for land in Bangkok and may finalise a deal soon," the source said. Fateh had said that Glomac had received offers from several multinational firms involved in automotives and pharmaceuticals to build more warehouses and distribution centres in Thailand. He said the logistics and distribution businesses are picking up in Thailand, especially those near Suvarnabhumi Airport. Thailand is the second overseas venture for Glomac after Australia, which is contributing marginally to group revenue. NEW YORK: World sales of major commercial properties fell 49 per cent to US$306 billion (US$1 = RM3.30) in the first six months of 2008 from the same period last year, as sales in developed countries were hit hard by the credit crisis and slowing economies, a report released on Friday said. Real Capital Analytics said dramatic shifts in the capital flows for commercial property became evident in the first half of 2008 as Tokyo overtook London and New York as the most active sales market and investors began favouring Asian markets. Sales activity fell sharply in many developed Western economies while Brazil, Russia, India, China and most other emerging markets posted gains. Emerging markets accounted for 25 per cent of all property sales in the first half of 2008, up from 10 per cent in the same period a year ago, according to the report that tracks transactions worth at least US$10 million. Development sites were the only type of property to see a rise in sales, up 11 per cent and led by a record US$2.3 billion paid for Chelsea Barracks in London. "However, with new developments in Europe being delayed and new regulations limiting land sales in China, this sector may soon experience the same declining investment other property types have," the report said. Overall office sales were down 60 per cent in the first half of the year versus a year ago, and sales of hotels were off 68 per cent.